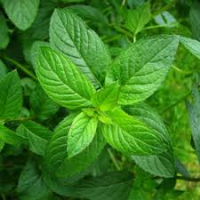 Also known as Brandy mint, English mint. A perennial, easy to grow, but can be invasive in gardens. Grows to 30cm high with pink to mauve flowers. The most widely used mint. It soothes stomach aches and is effective for colic and flatulence. It is said to help provide some relief for Irritable Bowel Syndrome. Peppermint oil has mild pain relieving effects and is good for tension headaches. It is best known use is as a breath freshner. Used since ancient times. 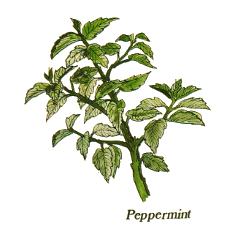 Greeks and Romans crowned themslves with peppermint at feasts and used the essence in cooking and wines. It is thought to have been first culivated by the Egyptians.